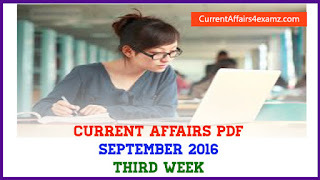 Hi Aspirants, here is the Current Affairs Quiz for 6 April 2016. These will be useful for all upcoming exams like SSC CGL 2016, Railway 2016 etc. 1) Who among the following was recently conferred with 2016 Hridaynath Mangeshkar Award? 2) India’s First Semi-High Speed Train (SHST) Gatimaan Express was flagged off on 5 April 2016 between New Delhi and ____? 3) Which state government has recently (April 2016) taken a decision to completely ban on all types of liquor (alcohol) throughout the state including Indian Made Foreign Liquor (IMFL)? 4) Which Bank on 5 April 2016 launched an India’s first of its kind Aadhaar-based Automatic Teller Machine (ATM) usage facility? 5) RBI on 5 April 2016 in its first bi-monthly monetary policy for the year 2016-17, has cut down repo rate by 25 basis points to ____ per cent? 6) National Maritime Day is observed on? 7) _____ was recently adjudged as the best Indian university in the first National Institutional Ranking Framework (NIRF)? 8) World’s first public dengue vaccination programme was launched on 5 April 2016 in which country? 9) World’s first White Tiger Safari was inaugurated at Mukundpur in Satna district of which state on 5 April 2016? 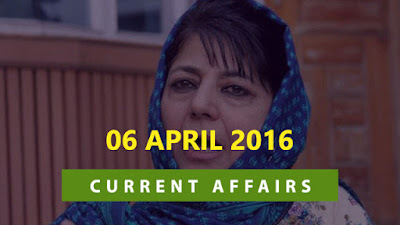 10) Mehbooba Mufti Sayeed on 4 April 2016 took oath as the first woman Chief Minister of?